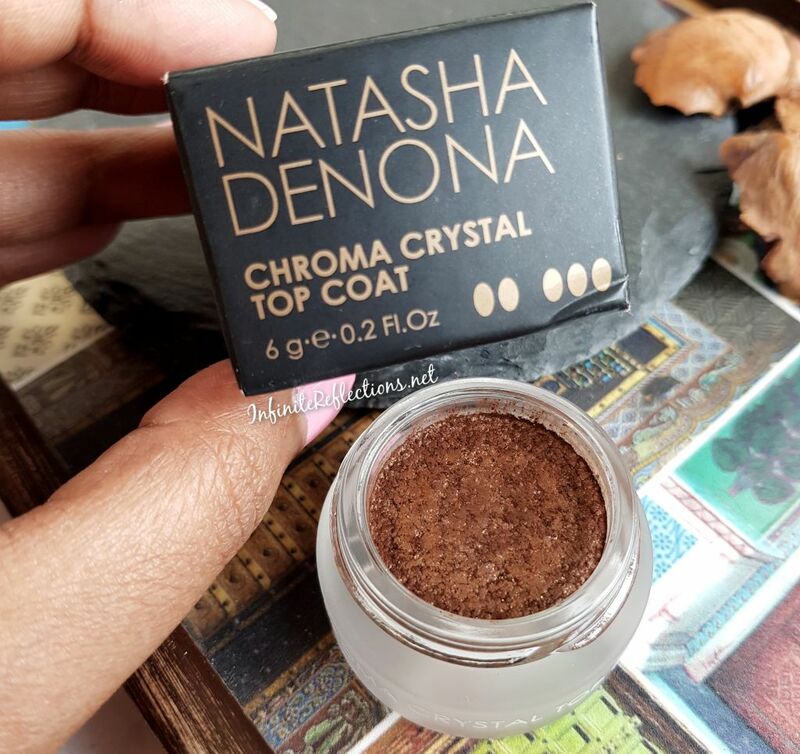 These Chrome Crystal top coats from Natasha Denona are cream-like eyeshadows which feel creamy to the touch but on applying on the eyelid they feel like applying a powder shadow. 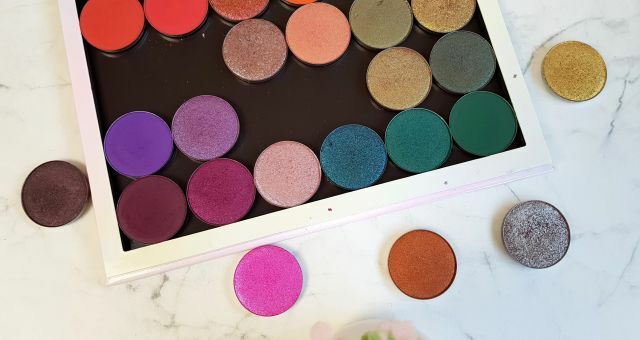 These can be applied directly on bare eyelids or can be used as toppers on other eyeshadows. Both ways, the effect is a really dazzling sparkly finish on the eyes and the eyes look really pretty. I bought one shade from Sephora and it retails for around S$ 42 here. For a single eyeshadow, that’s a lot of money but I got this when it was on 50% off. But honestly, if I go through this pot then I wouldn’t hesitate to repurchase this for full price. I love this shadow so much. In each pot, we get 6 gm / 0.2 Fl. Oz. of product, so I don’t think I am going to finish this anytime soon. 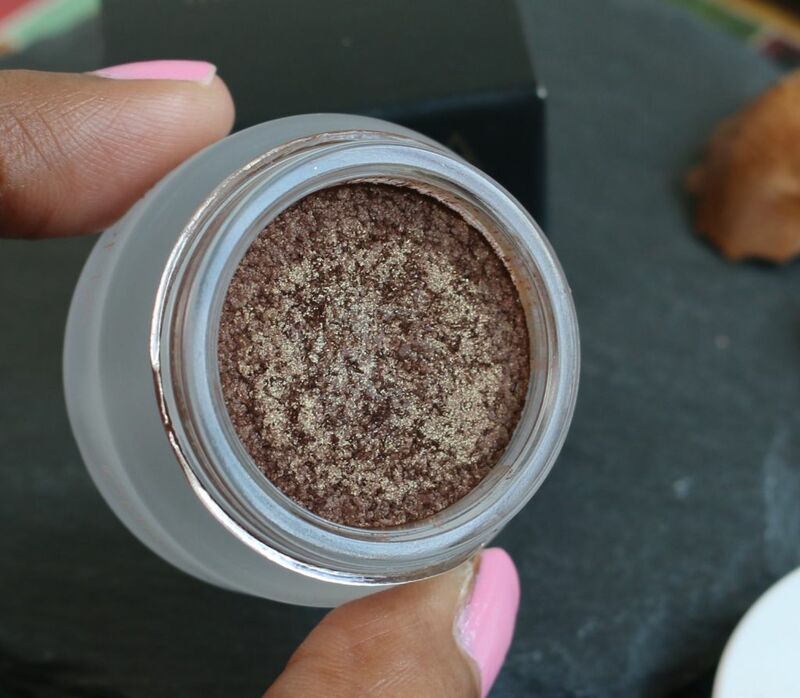 The eyeshadow is packaged in a round airtight glass jar, makes it more environmentally friendly. So, far I haven’t noticed any drying in the pot and it has been around 4 months that I have purchased it. 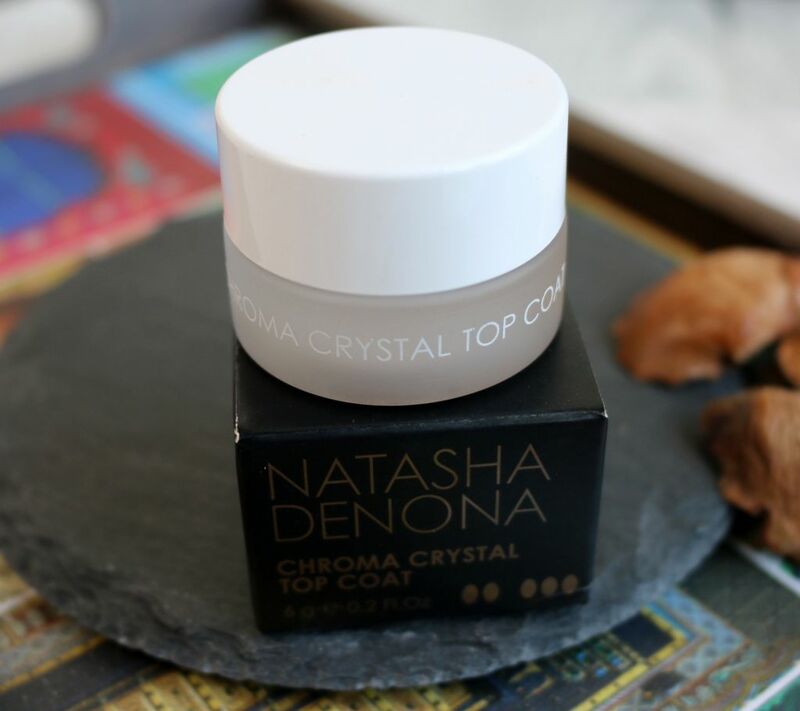 Natasha’s metallic shade extension of the Chroma Crystal Top Coat. These new shades can be applied on bare lids, on top of eyeshadow, or on top of lipstick for a dazzling effect. Creamy to the touch and on the skin provides a natural lustrous glass effect due to its pure pigments, real crushed pearls and chroma crystals. 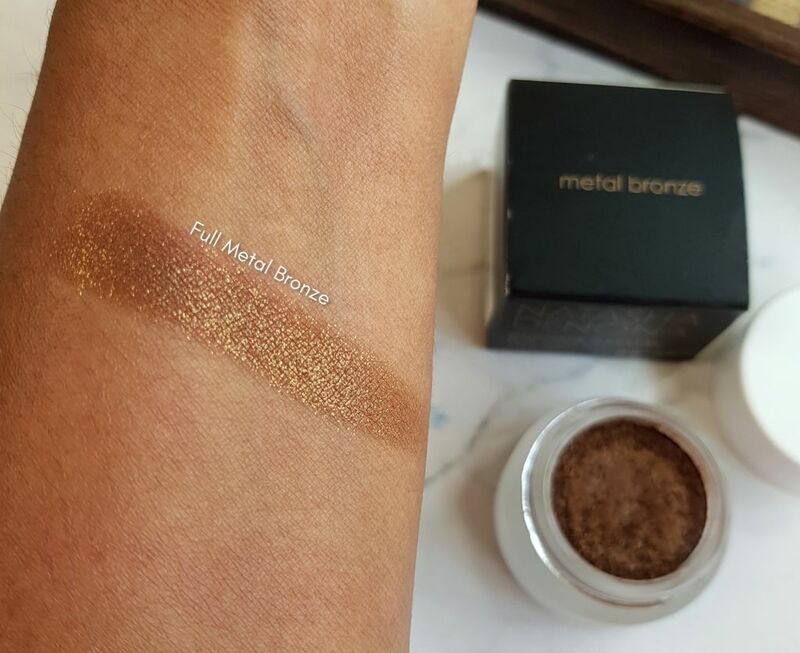 The shade which I purchased is called “Full Metal Bronze” and it is a beautiful brownish bronze shade which has some gold glitter infused in it. This shade is just beautiful. It gives a very sparkly glimmer effect to the eyes and I absolutely love wearing this shadow just on it own. I usually apply this on the eyelids with my fingers and then blend a bit of powder eyeshadow in the crease. The application is super easy, smooth and it’s a quick eye look to do but the effect is extraordinary. Specially, in low light settings, the eyes look amazing. These eyeshadows also claim to be waterproof and crease proof and I agree to a certain extent. The eyeshadow holds up really well against water but if you rub your eyes with water then it will tend to fade away. But, water alone doesn’t have much fading of the eyeshadows, maybe just a bit. The eyeshadow also doesn’t crease at all on me. I have worn this shadow for 5-6 hours and it lasts very well on the eyes without creasing. I also haven’t faced any kind of fall out with this either. I can actually do my eye look after applying the foundation without worrying about fall out. I think this is a beautiful formula of single eyeshadow. 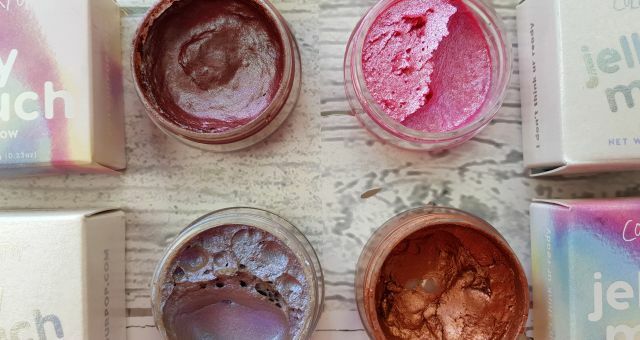 If you like, sparkly or glittery eyeshadows, you should definitely try these out. These eyeshadows will look beautiful for any kind of party, events or special occasions and I will highly recommend them. 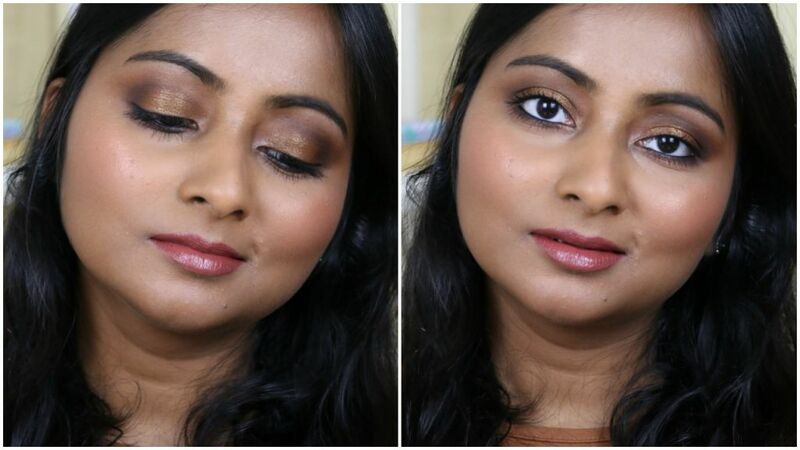 I have a quick video here on how I apply these shadows. That’s all for this post. Hope this was interesting and helpful. If you like glittery sparky eyes, then these are great!! She has duo chrome ones as well..